On the occasion of the Tatting Day, we collaborated to offer you something to discover a little more: the roll tatting! I admit that I had never been interested in this technique to the extent that the few images that I had seen had not seduced me, and unfortunately Edwige Renaudin mentions it without explaining it in her book. But I was wrong! My tests showed me that this technique allows very appreciable effects of matter. To start with the roll tatting, I based on the Pricilla Tatting Book n°3 pages 24-25. pages 24-25. My project was to create a different material effect between the rings and the chains. So I worked the rings in ordinary double stitches and rolled chains. The thread I use for the chains is thicker than the rings thread so that the DS form an unsightly extra thickness. The rolled points squirm. I try to solve the overthickness by unflipped double stitches. I firmly tighten the roll tatting so that they do not twist. Better, but not satisfactory: the beginning and the end of the chains remain aesthetically imperfect and some chains still twist … I was ready to throw the roll tatting to the nettles! Thank you Helen, thank you Elsa: chains only with roll tatting. The result is incomparably better! So NO double stitch or unflipped double stitch for the chains! Note that the chains that were still twisted could be rectified by slightly wetting the work. Pour vous permettre de tout savoir sur le roulotté, Elsa has written an exciting article. Claire translated Elsa’s article in English. Julie has a vidéo to help you learn the technique. 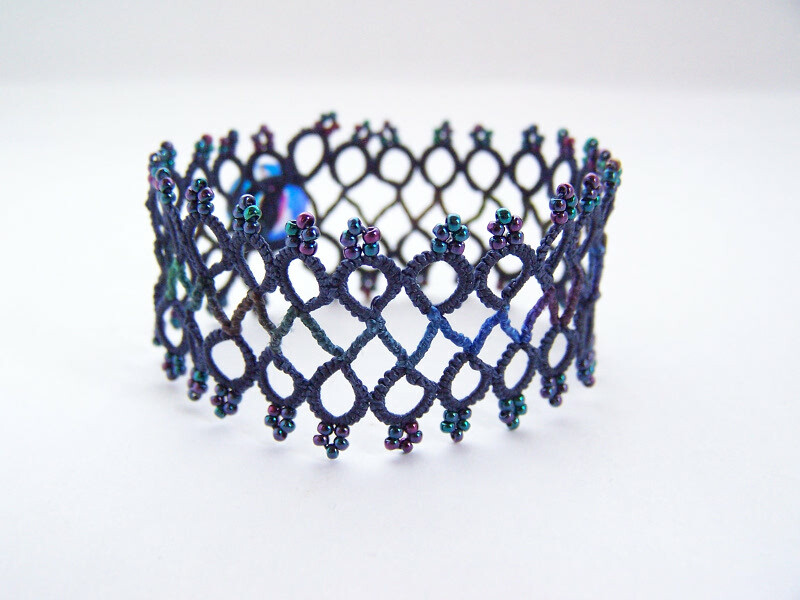 Elsa offers a pattern for ring in roll tatting. As for me I propose you a simple pattern to practice roll tatting with chains. I realized the clasp of this bracelet thanks to a split chain. Elsa did a tutorial on this. You will adjust the length of the chain according to the size of your button. Very nice! And thank you for sharing the links with instructions and tips.